We’re not early risers but we made exceptions on our second day in Vientiane. 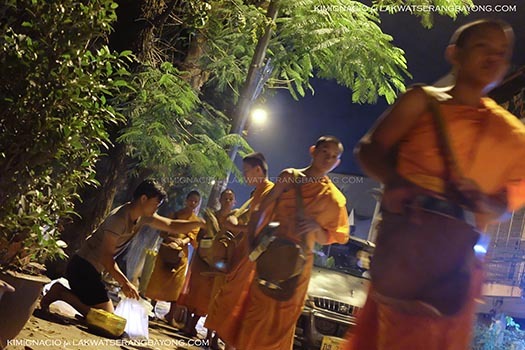 We woke up before dawn to catch the monk’s alm procession locally known as Tak Bat. 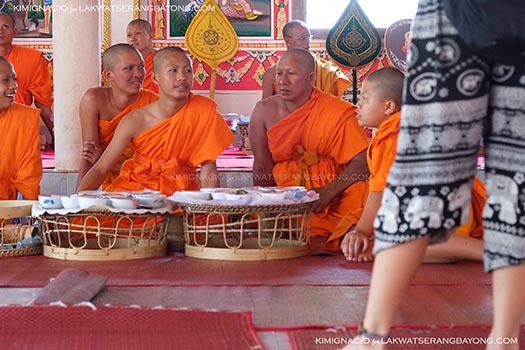 It is a ceremonial tradition inherent in Lao and Buddhist culture where in a group of monks in their bright saffron robes file in single line to receive rice and other donations from the faithful kneeling on straw mats. We were the only tourists present at the ceremony and we maintained a polite distance as we tried our best to be inconspicuous while observing this beautiful tradition. 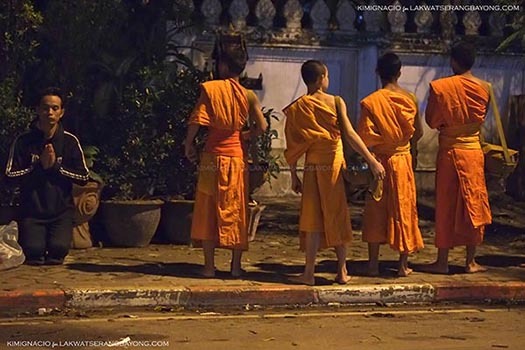 The barefoot monks walk so silently that I didn’t even notice a group was lined up behind me and was startled when they strode past. 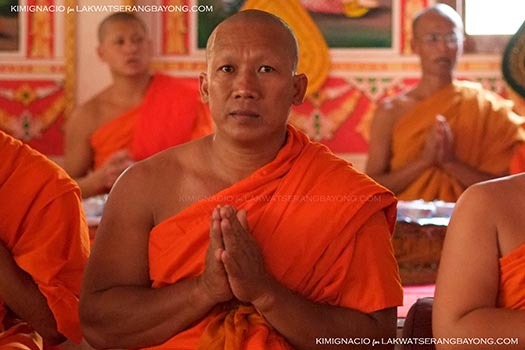 Women cannot be in physical contact with the monks so I respectfully moved out of their way. It was still dark when we ambled back to our hotel after the ceremony. We went back to bed and slept in waking up again when my stomach started grumbling looking for food. Hotel breakfasts most often leave much to be desired but our breakfast that came with the room rate was delicious and the coffee strong. I had the Guatemalan farmers breakfast of beans, toast and eggs while Kimbee had the waffles served at the lovely tiled dining area adjacent to the sun drenched courtyard. While we were lingering over coffee, the staff informed us that our tuktuk driver has arrived. 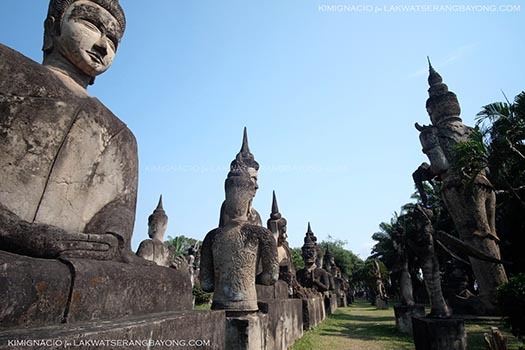 We are going back to Bangkok that evening but has enough time to see more of Vientiane. 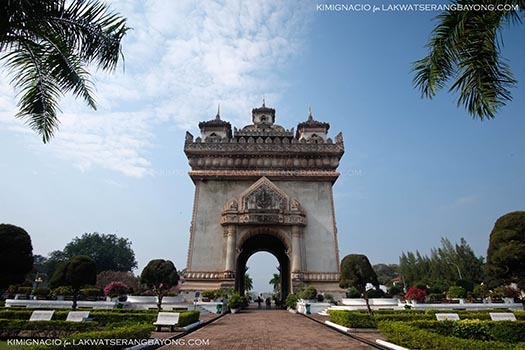 We retraced our steps back to Patuxai and for an entry fee of 5,000 LAK per person, we get to go up the top floor with unobstructed view of the palm tree lined avenue and park. It was a beautiful morning and there was no trace of yesterday’s storm. 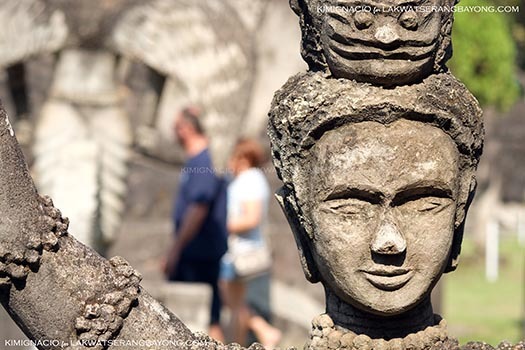 Patuxai is opened weekdays from 8 AM to 4 PM, extended up to 5 PM on weekends. 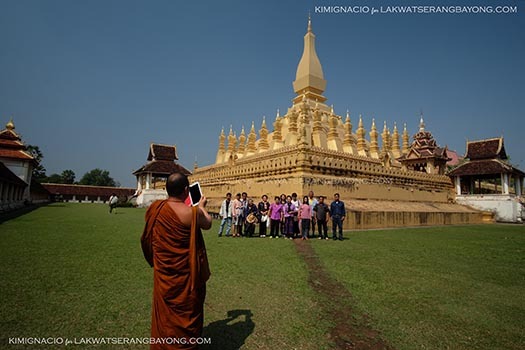 Next stop is at Pha That Luang the golden sacred stupa and the most important national monument in Laos. Legend has it that this has a piece of Buddha's breastbone. Open from Tuesday to Sunday from 8am until noon & resumes accepting visitors at 1 to 4 PM. Admission is 5,000 kip. 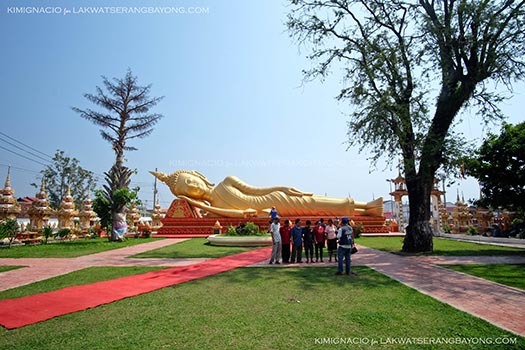 Chauk Htat Gyi Pagoda with its reclining Buddha is in a temple complex next to Pha Tat Luang. We were about to find our way back to the exit when we heard chanting. 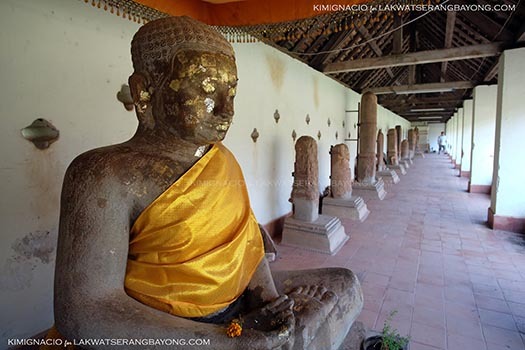 We entered a high ceilinged hall and saw monks sitting cross legged assembled around several low rounded tables called “ka toke” with bowls of food. A group of local women bearing baskets and wearing scarves on their shoulders were on the sideline. We would have wanted to stay longer and watch the gathering but it was almost past 1 PM and we need to check out of the hotel. The sight of communal dining also made me hungry. Our hotel only serves breakfast so we grabbed late lunch at a Korean restaurant ride beside the hotel, checked out and made our way towards Thanaleng train station on board the same tuktuk we’ve commissioned since yesterday, but not before stopping at Wat Xieng Khuan or Buddha Park. 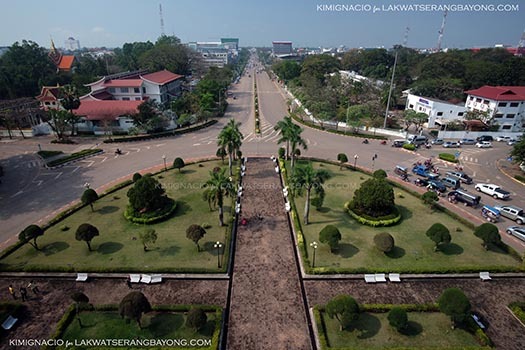 The park is about 25 kilometres southeast of Vientiane, along the Mekong River. The ride though was bumpy and dusty and took over an hour. If we ever get lucky enough to go back, we’ll probably be taking a car to navigate this road, more comfortable that way. 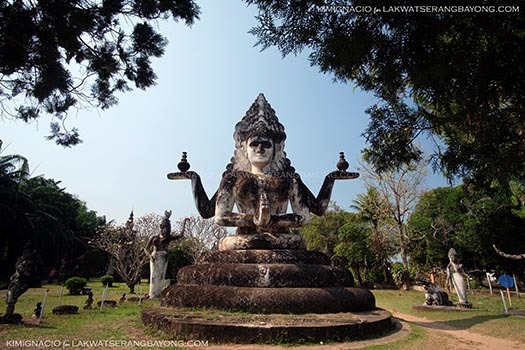 Wat Xieng Khuan is a famous sculpture park with more than 200 religious statues. 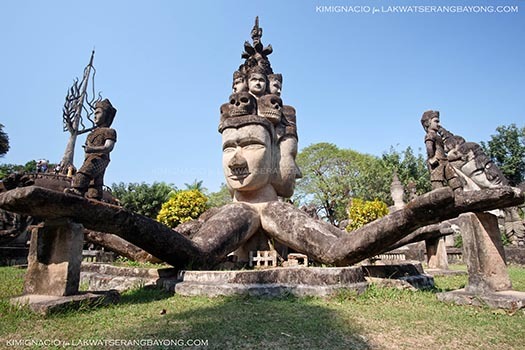 Built in 1958 by a monk who studied both Buddhism and Hinduism which explains why his park is full not only of Buddha images but also of Hindu gods as well as demons and animals from both beliefs. It’s weird. 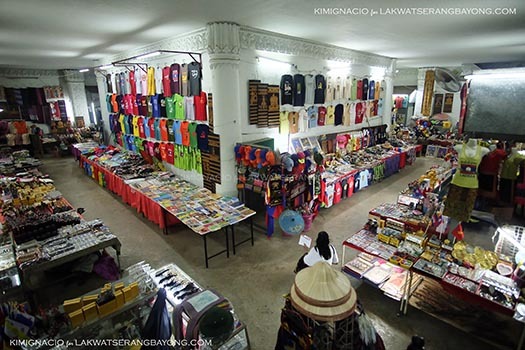 Open daily from 8 AM to 6 PM. Admission is 5,000 LAK per person and 3,000 LAK per camera is charged. 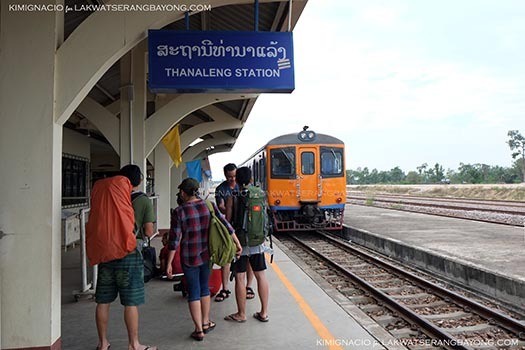 From the quite bizaare park, we traversed about 6 kilometers east of the Friendship bridge to Thanaleng train station. We thanked our driver and paid him 1,300 Baht, more than what we previously agreed on but we were happy with his service. There was a language barrier but smiles are universal and we took the repeated bows with his hands pressed together that he found it to be a fair trade. The station was desserted save for the railroad employees and Immigration officials. After paying the 40 Baht exit fee per person and collected our stamped out passports, we settled in the plastic chairs at the platform and made ourselves comfortable while waiting for the shuttle scheduled at 5 PM that will take us to Nong Khai. Soon, people and backpacks have started trickling in breaking the stillness and crowding the station. It made for an interesting people watching activity to pass the time. 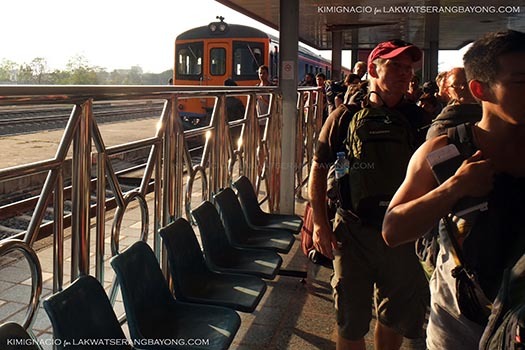 After a 15 minute shuttle ride and upon arrival in Nong Khai, we exited the train and lined up for Thai immigration. We have over an hour to clear passport control but the queue was extremely long and there were some people being questioned more than the usual that the process took more than 2 hours. We were worried that we won’t be able to make our connection but Train 70 waited until everyone has been cleared and left later than the scheduled 7 PM going back to Bangkok. 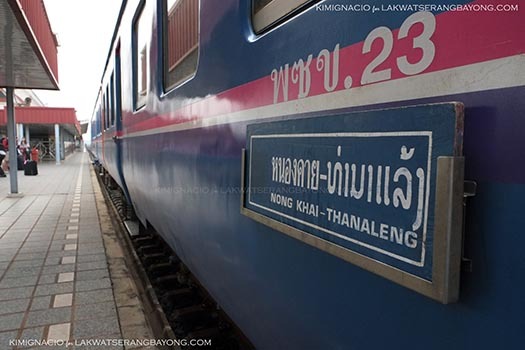 We hurriedly purchased our train tickets to Bangkok after being stamped in and were relieved that our prefered firs class sleepers were still available for 1,250 Baht per person, paid for in Baht and in cash. At the time of travel, 1 USD is equals to 35 baht. We boarded and settled in our cabins and ordered dinner right away. The stress of long lines and almost being stucked in the middle of nowhere Nong Khai made us hungry.